Back in April, my boyfriend Raffer and I got a wedding invitation from a friend of his who was planning to have a summer wedding in Norrköping, a city south from Stockholm. The couple requested custom stamps for their wedding stationary and I was inspired to make new stamps for newly weds. I didn't want to make up with fake names and dates for the sample stamps (they'll just go to waste in that case) so in my newsletter to my frequent customers as well as on my Facebook page, I offered a custom wedding stamp giveaway. 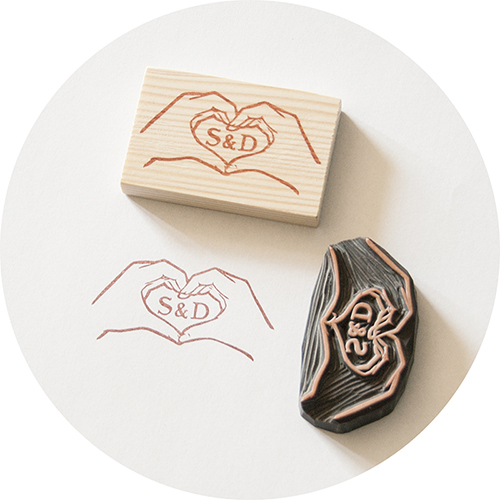 Having come up with a few different designs, I wanted to work with couples who would be having handmade/craft-themed weddings and create personalized stamps for them. Cindy was one of the people that got in touch with me after reading my newsletter. She's the matron of honor for Brittany and Jason's wedding. 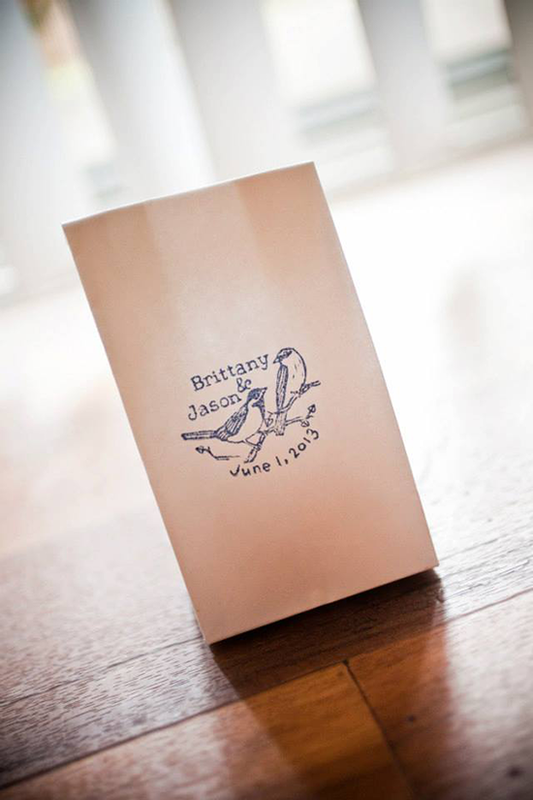 After going through some details she decided on the design that best fit the theme and I created a stamp for Brittany and Jason. A hand-carved stamp featuring two love birds on a branch and tiny heart-shaped leaves sprouting. 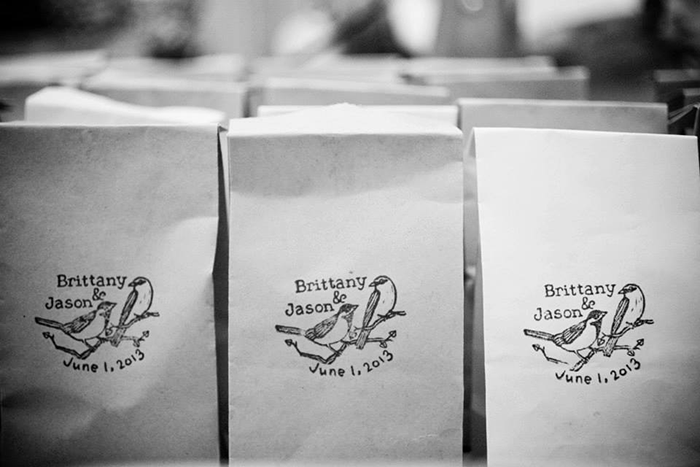 Yesterday Cindy was kind enough to send over the pictures she took of Brittany and Jason's wedding favors - simplistic brown paper bags with imprints of the personalized stamp. So simple yet stunning! I love the black and white shot too! It's always nice to know that my stamp is put to good use by loving hands. I have the most awesome customers! 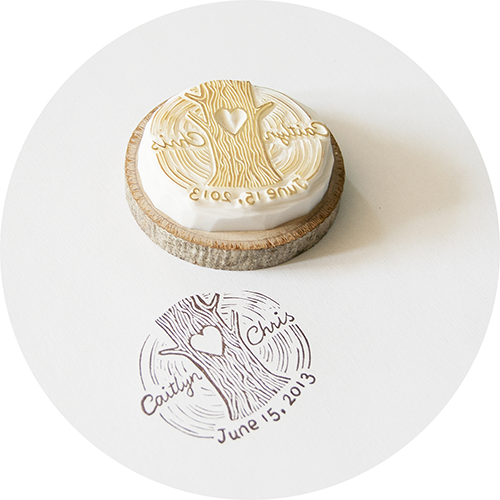 Here is another custom wedding stamp I made for Caitlyn and Chris' wedding. 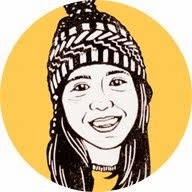 Caitlyn has been my customer since good old Etsy time and she's always been great to work with. A tree trunk with heart engraving; bride's and groom's names and wedding date. 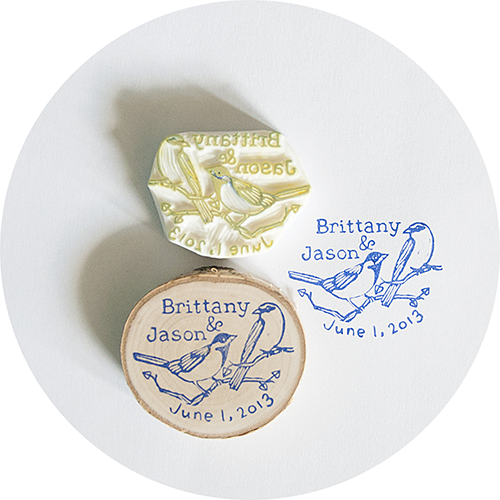 So that's it for the custom wedding stamp giveaway! I've hosted quite a few giveaways (like my Facebook page for the latest one! ), and if you can't wait for that, you can always look around in the shop, or get in touch by e-mailing me at tyr@thisisjusttosay.co - request a personalized stamp, or just say hello! I love the idea of getting a stamp, I would be able to personalize a lot more. I'm in the midst of planning my wedding and my favors is a ton of assorted candies like saltwater taffy and chocolate fudge. Our wedding is a beach theme so I could even personalize the stamp to incorporate the beach theme. Awesome idea, thank you so much!